Audi Korea began test running its partially self-driving car at the country’s test bed for automated vehicles in Gyeonggi Province, the company said Wednesday, becoming the first import carmaker to test out its self-driving technology here. 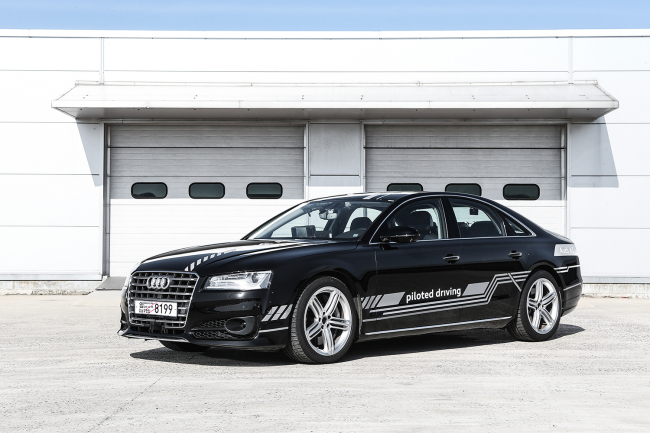 Since receiving authorization to test out its driverless Audi A8 flagship car this March from the Ministry of Land, Infrastructure and Transport, experts from German headquarters flew in last month and held a pre-test run at K-City, Korea’s test bed for self-driving vehicles. Audi will gather information to develop advanced driverless techniques on data collected here, such as when the driver needs to interfere by factoring in Korea’s road conditions. “As the first imported automaker to obtain an autonomous driving test permit, Audi Korea is very pleased to be able to contribute to the commercialization of autonomous vehicle and the advancement of the technology in Korea, which has been focused on development of autonomous driving technology and related infrastructure,” Managing Director of Audi Korea Cedric Journel said. The decision to test run its A8 automated vehicle was based on the government’s full support, the company said. Under plans to commercialize level-three self-driving cars by 2020, the government provides important data such as detailed maps for free. Level-three self-driving means the car can carry out all aspects of driving automatically under certain circumstances, but a driver must be present to take over if something goes wrong. Prior to Audi A8 joining the list, roughly 40 driverless vehicles developed by about 17 local companies have been undergoing testing. Audi world premiered the fifth-generation Audi A8, which is the industry’s first mass produced level-three self-driving car, at the Audi Summit held last July, the company said. The Audi AI Traffic Jam Pilot featured in the A8, allows the partial hands-free driving by utilizing its central driver assistance controller, dubbed zFAS that determines whether the driver has to interfere by processing data collected from sensors and camera.